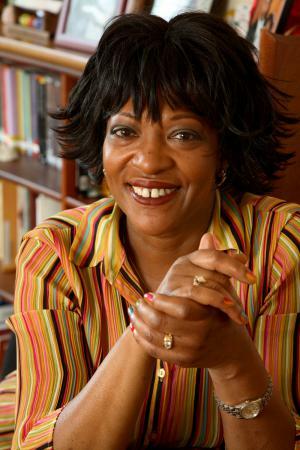 Rita Dove, editor of the recently released Penguin Anthology of 20th Century American Poetry read at Busboys and Poets on October 26, 2011 for one of Teaching for Change’s and Busboys and Poets’ free author events. As she put it, her heroes of poetry were often not included in many anthologies, and as times changed, they were still marginalized to anthologies focusing on specifically race and gender. Ms. Dove said she wanted everyone to enjoy the stories and poems of her heroes, and she took great pains to really mix and match up poets whose work she felt stood out in the 20th century or didn’t get its deserved acclaim. 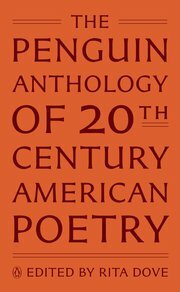 Interestingly enough, Paul Lawrence Dunbar’s ex-wife, Alice Dunbar Nelson is among the pages, as well as poems by a gumbo of other unsung poets, who rub shoulders among the pages with Derek Walcott, Sonia Sanchez, W.S. Merwin, Robert Creeley, Elizabeth Bishop, and Amiri Baraka. Even more special, Ms. Dove revealed that she included poems that were more like B-Sides to some poets’ usual and commonly anthologized poems. During the Q + A session, many chose to sing Dove’s praises, while others asked about her time as the National Poet Laureate, advice for aspiring poets, how she crafts her poems, and even more provocative, how she feels about the spoken word movement. As an introduction to her reading, two teenage members of the DC Youth Slam Team, which co-sponsored the event along with Teaching for Change and Busboys and Poets, opened with spoken word poetry performances that impressed Ms. Dove. Lauryn, a 17-year-old student at Duke Ellington School of the Arts (pictured left) read a new poem of hers about romance, and Alexis, a 17-year-old student at National Collegiate Preparatory Public Charter School performed a powerful piece about slavery and prisons. 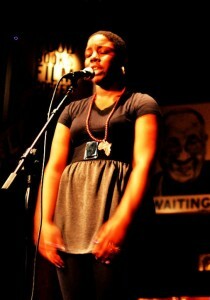 Repeatedly throughout the night, Ms. Dove remarked on the quality and importance of these young voices. The DC Youth Slam Team (a program of Split This Rock) is coached by Teaching for Change’s very own Jonathan B. Tucker, who served as host for the reading and moderator for the Q + A. Busboys and Poets owner Andy Shallal attended the event and was vocal about the need to support independent, nonprofit bookstores like ours. From high school and college students to local teachers, English professors and poets of all stripes, the audience was as diverse as Ms. Dove’s selections in the anthology. Other attendees included Teaching for Change staff member and Busboys and Poets Poet-in-Residence Derrick Weston Brown, Carolivia Herron, Lisa Pegram, and Joshua Gray. Full audio recording of this reading will be available online soon. Jonathan B. Tucker and Derrick Weston Brown contributed to this article.